For three decades, the U.S. and Western Europe have enjoyed unprecedented prosperity in a dynamic partnership. But disputes over trade and relations with the Soviet bloc now threaten to rip the Atlantic Alliance asunder. TEMPERS are rising on both sides of the Atlantic. Political positions are hardening. Relations between the United States and its allies in Western Europe are at an all-time low. "There is more mutual distrust of intentions," says one British journalist, "than any time since the end of the war against Hitler." France's Foreign Minister Claude Cheysson summed up the situation most succinctly when he expressed the belief that a "gradual divorce" was taking place between America and Europe. Mr. Cheysson's somber prediction should not be taken lightly. Should he be proved correct, many people will be hurt — as in divorces on the individual level. Despite the day-to-day smooth flow of trade still conducted across the Atlantic, disputes over export and fiscal policies are reaching the acrimonious stage. These rows would matter less were they not taking place in the midst of a world recession. One issue is particularly explosive at the moment. The United States, faced with severe unemployment and rising excess capacity in the steel industry, has decided to slap a penalty on those steel imports from Europe that the United States has determined to be under priced because of subsidies to producers from European governments. The various national steel industries in Europe, too, are fighting for their lives. Several governments have undeniably propped up their ailing industries. For their part, European Common Market countries, staring at a record 10 million unemployed, have expressed concern for many months about U.S. policies that they believe help keep them in the economic doldrums. Europeans charge the conservative fiscal program of President Ronald Reagan keeps interest rates high in their countries, stifling job-producing investments. The list of actual individual transatlantic trade quarrels is now so extensive that the regulations established by the General Agreement on Tariffs and Trade (GATT) are in danger of being overwhelmed. Nation after nation is resorting to one devious means after another, such as complex bartering arrangements, to circumvent the GATT rules. Experts in the field of international trade are fearful the entire post-World War II Free World economic structure may soon collapse under the accumulating weight of complaints and countercharges. There is another issue, however, that threatens to drive the deepest wedge of all into the transatlantic partnership. It goes far beyond money and jobs, critical as these are, into the very substance of the relations between Europe and America. This divisive dilemma surrounds the building of a natural gas pipeline from Siberia in the Soviet Union to connect with existing pipelines heading into Western Europe. The project — the largest in the history of East-West trade — was originally intended to deliver gas to Italy, West Germany, France, Switzerland and Austria by 1984. Since the project was first mooted years ago, Washington has fretted that the pipeline would make West European nations too dependent on the Soviet Union for energy supplies and thus produce a dangerous security situation in the event of any future East-West crisis. A recent European Community report, in fact, underscores the potential dependence impact. When the gas deal is completed, Italy could depend on the Soviets for 35 percent of gas consumption, West Germany 34 percent and France 26 percent. This dependence is compounded by the fact that by 1990 gas supplies from outside EC production areas, including the Soviet Union, are expected to playa much bigger role in Europe's overall energy picture than they do today. Europeans have generally called the U.S. position an exaggeration, claiming that the Soviets have proven to be a reliable trade partner in the past. Moreover, according to their argument, the U.S.S.R. desperately needs the earnings that the sale of the gas will produce in order to buy grain from the United States (which the Americans have refused to embargo). Moreover, Europeans claim, the pipeline project should reduce Western Europe's dependence upon energy sources from the unstable Middle East. The pipeline dispute took a sudden downward turn toward the end of 1981. Sixteen days after Polish authorities declared martial law, Washington imposed economic sanctions against the Soviet Union, which the United States regarded as directly responsible for the Polish action. Some of those sanctions were aimed at the projected gas pipeline. The giant General Electric firm was banned from supplying millions of dollars worth of parts for turbines to propel the gas along the pipeline. A license for Caterpillar Tractor' Company to export pipe-laying equipment to the Soviet Union was canceled. West European politicians, as well as trade union leaders, were alarmed. Several European firms had signed pipeline contracts with Soviet authorities and were relying upon American products to fulfill them. As the seven-nation Versailles economic summit approached last June, Western European leaders worked to maneuver the United States into a softer position on the pipeline issue. At the Versailles conference, attended by this writer, an unwritten compromise appeared to have been structured. There was talk of allowing Europeans to once again have access to the missing American equipment, in return for tighter credit restrictions on subsequent East-West trade. After learning that the French had rejected substantial credit reform, the United States extended its pipeline sanctions embargo to European subsidiaries of U.S. companies. Further, no company abroad could use licenses from U.S. companies to build vital pipeline equipment. Especially hard hit were companies in France, Italy and Britain constructing compressor turbines for the pipeline, using U.S. technology..
Europeans reacted with understandable outrage. Massive contracts were suddenly thrown into question, along with thousands of jobs. Even the future of some financially shaky companies in Europe was in doubt. Over the next several weeks, one nation after another in Europe announced it would defy the Reagan ban. The governments of Britain, America's otherwise staunchest ally in Europe, and France announced that companies in their nations holding U.S. construction licenses would be required, under penalty of law, to honor Soviet contracts for the pipeline. The Americans countered that it was the Europeans who were guilty of breaches of contract; that the terms of the licenses for General Electric designed products provided for changes in export regulations toward the East bloc that the U.S. government might wish to enact. The West Germans, meanwhile, threatened to take the United States before the International Court of Justice. And President Francois Mitterrand of France declared that the Versailles summit, for which he acted as host, had turned into a mockery. The value of future summits, he said, was nil. Some sort of political showdown over the pipeline row appears inevitable mainly because both sides view relations with the Communist eastern bloc in quite differing light. 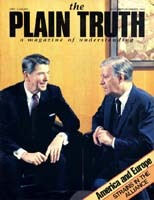 Mr. Reagan, in European eyes, embodies the so-called hard-line view toward the Soviet Union. He certainly showed as much on his stopovers in European capitals earlier this year. In a speech delivered to the British Parliament June 8, the American president called for a global "march of freedom and democracy" that, he hoped, would "leave Marxism-Leninism on the ash heap of history." It goes without saying that Moscow reacted very vigorously to Mr. Reagan's remarks. Not a few Western Europeans criticized him as well for embarking on a crusade to overturn the status quo in Europe and to "destabilize" the Soviet sphere of influence on the continent. Others criticized the American leader for holding out too much hope for the use of sanctions to change the nature of affairs in Eastern Europe. Reduced trade, they argued, would only make the resilient and strongly patriotic Soviet population, accustomed to more austere living conditions than the West, only tighten their belts more, if convinced some sort of economic warfare had been declared against them. It is foolish, they claim, to believe that the world's second largest economy, the U.S.S.R., could be forced by economic measures to compromise on its vital security interests in Eastern Europe, gained at much expenditure of human and material resources in the last war. "Pull Back from the Brink"
Still other voices on both sides of the Atlantic have criticized the administration in Washington for making such a principled stand so late in the game, when only harm to the Western alliance can result. "Today, the issue is the wisdom of American policy, not the merit of its arguments. Today, America's friends in Europe ask in bewilderment: Why did the Reagan administration go for a high-cost, low-payoff policy which would only come to grief? The deal having been signed and sealed, there was only the faintest of chances that the Europeans would meekly renege on their contracts. In the affairs of nations, there comes a point where the cost of victory tends to dwarf the value of the original objective. "Was the attempt to punish the Russians worth the damage to the alliance which will take years to heal?... Why not pull back from the brink before disaster really settles in?" The disaster that many fear is the disruption of the interlocking national defense policies upon which the security of the Western world has relied since shortly after the Second World War. NATO embodies the Western half of the taut East-West power balance in Europe and has helped secure the longest period of peace in European history. Without harmony on trade issues and like mindedness toward the East bloc, the focal point of NATO's orientation, it is unlikely that the alliance can last. It will be more difficult than ever for Western European leaders, for example, to vigorously pursue the plan to update the alliance's nuclear arsenal next year as scheduled. This in turn will intensify agitation on the western side of the Atlantic for the United States to cut its ties to its "ungrateful" NATO partners. Calls for an American military withdrawal from Europe are indeed coming more frequently than ever. For example, a leading U.S. figure in the field of strategic thinking, Irving Kristol, called for the reconstruction of NATO along with a new and independent role for a nuclear-armed Europe, in the August 12, 1982, issue of The Wall Street Journal. But that's the big question! Would a future independent, nuclear — armed Europe, comprising nations that have been at odds with the United States over fundamental economic and political issues, choose to remain allied with and friendly toward the United States? According to James Oliver Goldsborough, author of the book Rebel Europe, Western Europe is obviously in a transition period — "the historical stage at which Europe now finds itself, namely halfway between a much weakened Atlantic system and a still embryonic European framework." Readers of The Plain Truth have been told in many articles down through the years that Bible prophecy foretells that there is yet to come the final end-time restoration of the Roman Empire. This will occur just before the divine ushering in of the peaceful world tomorrow, brought about by the restoration of the kingdom of God on earth. The prophesied European combine will be composed of "ten horns" — meaning 10 nations or ruling entities (Rev. 17:12). This resurrected Roman Empire, controlling its own destiny and defense, will be powerful enough to stand up to both the United States and the Soviet Union — perhaps even to demand a release of some Soviet satellite European nations in return for a promise of trade and nonaggression with Moscow. The United States — and Britain — will be left on the outside looking in! The prophetic outline of Europe's near future is becoming clearer as a result of the widening rift with the United States. The Plain Truth will continue to keep its readers abreast of the onrush of critically important events and trends in Europe. VERSAILLES SUMMIT: Leaders of the Free World's seven industrial powers convened last June at Versailles Palace, near Paris, France, for their annual conference. Cooperation appeared to prevail, but soon afterward frictions developed again over trade matters, especially those dealing with Eastern Europe.